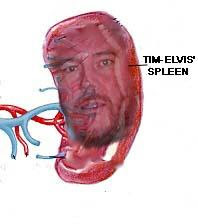 Hi, as the title suggests, I am Tim-Elvis' spleen. He asked me to be the guest blogger and write a short essay about what it is like to be a spleen. He said to me, "Okay spleen, you got some 'splainin' to do." Tim-Elvis says things like that alot. As organs go, spleens aren't very large. I am about the size of a fist. I am located in the left side of Tim-Elvis' abdomen below his diaphragm. Although small, I do have a large blood supply. That's because my job is to clean blood. I am a cleaner, kind of like that Harvey Keitel character in Quentin Tarantino's movie Pulp Fiction. I thought that was pretty good movie, particularily as a comeback film for John Travolta. Though I thought he peaked when he played Vinny Boberino in Welcome Back Kotter. But, like Tim-Elvis tends to do, I digress. My other job as a spleen is to make special cells called antibodies, which are used to destroy germs. I also make a type of white blood cells (called lymphocytes). As a blood cleaner, I take out foreign substances from Tim-Elvis' blood and remove worn out blood cells. I'm kind of like a border guard. It's actually kind of fun to mess with germs. I stop them and they are always asking to see my badge. I of course reply, "Badges, badges? I don't need no stinkin' badges." This is spleen humor. I also regulate blood flow to the liver. The liver is pretty demanding, too. All day and all night, it's, "Hey spleen, how about some more blood." Geez, give me a break. That's about it. I mean spleens are important, but we don't get all the publicity like hearts or livers or lungs. I'd like to see them do my job, though. The stupid heart has never had to clean anything in it's life but what an ego. Anyway, that's about it for Tim-Elvis' spleen. I'm just a mean blood-cleaning spleen. You're doing fabulous work down there spleen. Really, I'm the first to admit it. Unfortunately for me my own spleen has read your essay and is now getting all uppity and demanding. 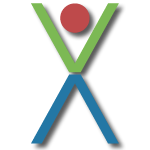 It's threatening to unionize all the lesser known organs. If that happens who knows what kind of crazy demands they might make? What if they go on strike? Where am I gonna find scabs to cover for them? Oh, you've opened up a real can of worms here Tim-Elvis' spleen. I hope you're satisfied. First, I want to appologize for the speen. He told me that he was an accomplished writer. I didn't realize that all he was going to do was vent. Oh, I get the scab pun. Funny. Is it bad of me to wish I could write this well in order to impress my English professor? Writing is in your blood. All of the Healy's have the gift...except for your father and your other uncle. I don't think your cousins have the gift either, but everyone else in the family.